Isn’t there something momentous and important in the air? Some sense of inevitable change, though the process may be invisible right now to everything but your instincts? Something just a little trippy? With your ruling planet, the mighty Jupiter, making its final sweep through your sign these weeks, don’t take anything for granted. 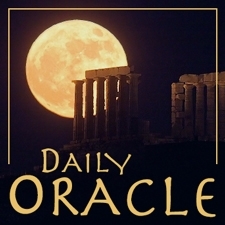 Today’s Oracle takes us to the Pisces monthly for February 1999. Isn’t there something momentous and important in the air? Some sense of inevitable change, though the process may be invisible right now to everything but your instincts? Something just a little trippy? With your ruling planet, the mighty Jupiter, making its final sweep through your sign these weeks, don’t take anything for granted. Be especially mindful of the ideas of closure and completion, and consider just how much you have learned, and how far you have come in the past twelve years, and how prepared for life you now are. Be generous with your opinions of yourself. Give yourself some room to visualize and create and even conquer. And as for that pearl of information you’ve been nagging the universe to produce, that little master key to the gemstone file? Be patient. It’s on its way.